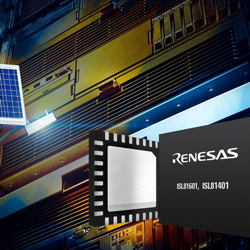 RS Components is shipping a new board that has been designed for the evaluation of Renesas Electronics’ recently launched ISL81601 bidirectional buck-boost controller IC. The ISL81601EVAL1Z evaluation board integrates the ISL81601, which is a true bidirectional four-switch 60V high-voltage synchronous buck-boost controller. Using the silicon vendor’s proprietary buck-boost algorithms, the chip provides peak and average current sensing and monitoring in either buck or boost mode. It can assure high reliability for end equipment by giving cycle-by-cycle current limiting in fast transient conditions – in both directions and at either the line or load end. Other abilities of the ISL81601 include external soft-start, independent enable functions, and a broad series of protection features, which includes under-voltage, over-voltage/current and over-temperature. The IC also produces peak efficiency of up to 99% for POL and voltage rail conversion; a gate driver that produces up to 20A for the buck-boost output; and programmable switching frequency ranging from 100kHz to 600kHz, which aids optimisation of inductor size. The evaluation board provides a very wide input range – from 9V to 60V –, and both the board and the IC are ideal for a broad selection of applications such as battery backup, USB Type-C power supplies and chargers, and redundant power supplies. Also, due to the chip’s wide input-voltage range, it is expected to be regularly used in telecommunications applications, battery-powered industrial equipment and in the automotive aftermarket, as well as other applications in medical equipment, robots and drones, and security surveillance markets.